--the mixer blends the herbs in...no need to knead as much. Just roll and cut. Keep em 1/4" thick..thicker gets gross. --measure the dry stuff as the batch bakes so you can keep the trays and dough rolling through. I just made about 7 batches. Nice. Also, made a twenty five pound lasagne for my tiny, baby son. When they started to proclaim that we were getting 10 inches of snow, a girl starts worrying about how to feed the children. Lasagne seemed to be the thing that popped into my head. Now we have enough for a football team anticipating the end of the world. Planning around our trip to LA. Hopes to see lots of mexican stuff, skate and surf stuff, and find those magic screenprinters and sticker makers that the skate and surf guys use. We are looking forward to mexican food, japanese food, passion fruit iced tea, fresh rosemary growing in the parks by the seaside. Swimming and maybe a little relaxing. He has a real unique style of guitar playing & a great talking blues style of delivery. They just don’t make anybody like Spider John Koerner. They broke the mold. As all great originators, like Woody Guthrie or Bob Dylan, anybody else who tries to imitate them would just look like that, an imitator. I do "I Ain’t Blue" in my shows and recorded it on my first album. It’s one of my favorite songs of John’s, but his other songs I love to play just for my own enjoyment; but I can never come close to playing them as well as he does." 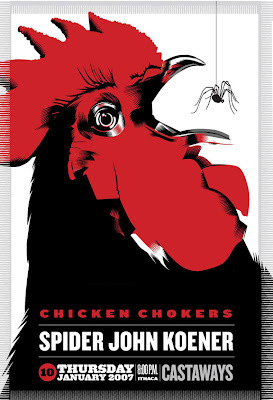 So, I have a poster to make for the Chokers with a spider. Fun...but need to gun it out tonight. My pictures taken in the blue alley at Felicias on Flickr is on the Castaways site is also now on the Felicia's site. I guess this is a prompt to keep taking snapshots as there is a need for that sort of thing. All the packages are in the mail. Now I just have to remember who I forgot...there may be some outstanding cards...I think the labels may have gotten mixed up...but I have Wednesday with my girl Friday to change that out. We leave on Sunday at the crack of dawn...so lots to do between now and then. Another possible customer at Cornell for a holiday card (2008) based on the work I did this year for the Baker. You know, one could make a bit of money just doing holiday cards....hmmmm.